Includes: Mud, Bit, Flare and Pump information etc.. Displays the Lithology for the given depth in 10% increments. The Tool Tip Text fro this column will display the percentage and the name of the symbol under the mouse pointer. Displays the Porosity, Fluorescence and Cut for the given depth. 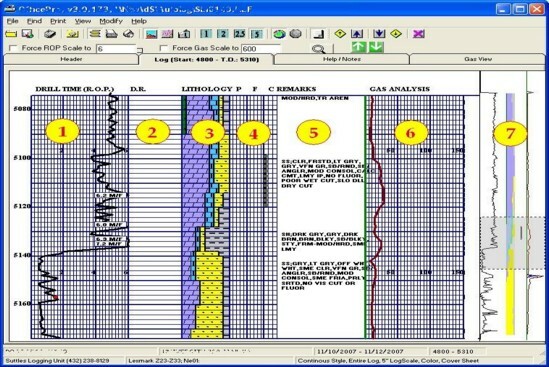 Gas analysis for the given depth. The Chromatograph is cycled every 3-9 minutes. An integrator built in to the logging program calculates the breakdown of hydrocarbons and enters them on the log. This view will always display the entire log. As log is added, it will be compressed to display it. The gray window represents the 100' of log being displayed. Click anywhere on this thumbnail to jump to that position in the log.